The Women's Enterprise Foundation is back at it again and doing what we do best...raising money! 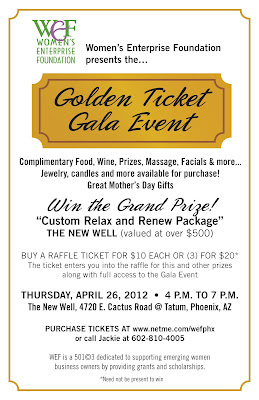 Come join us for complimentary food, wine, prizes, massages, facials and more at our "Golden Ticket Gala Event" on April 26th, 2012 from 4pm-7pm. The event is being held at The New Well, 4720 E. Cactus Road in Phoenix. Buy one raffle ticket for $10 or (3) tickets for $20. The ticket gives you full access to the Gala Event and enters you into the raffle for the grand prize and other prizes! For more information or if you would like to purchase tickets, please visit Gala Event. The Women's Enterprise Foundation is a 501(c)3 dedicated to supporting emerging women business owners in the greater Phoenix area by providing grants and scholarships.